A Northeast IPA isn’t really a sub-category of IPA or DIPA, but it may as well be due to the similarities these fantastic hoppy beers in that part of the country have. I’ve had hoppy ales from The Alchemist, Trillium, Lawson’s, Hill Farmstead, Treehouse, Bissell Brothers, Foundation, Tired Hands, and a few others from the Northeast. Not bad for a guy living in Chicago. The hoppy beers from these guys are exactly what I want for my beers and specifically my “flagship,” White Death. A lot of the beers from these guys are light colored, hazy, have a creamy soft mouthfeel, low in harsh bitterness but huge on hop flavor. That’s not to say you can’t find beers like that in other parts of the country, but these breweries in the Northeast seem to just “get it” when it comes to the hoppy styles. While not truly sub-categories of IPA, most people will admit that there is East Coast IPA and West Coast IPA. The standard East Coast variety tends to be a bit darker and maltier, maybe using more specialty grains, a bit fuller bodied, and not usually total hop bombs. Think Dogfish Head 60 or 90 Minute IPA as a good example of this. The West Coast IPA’s are usually a bit lighter in color and body, bitter, dry, and are huge in hop flavor with little in the way of malt. Think Stone IPA and Pliny the Elder. The Northeast IPAs seem to find a balance, taking the best parts of these two IPA types and combining them into an amazing whole. Most of them have a hazy blonde or orange color that ranges from 4 to 7 or so on the SRM scale. The mouthfeel of a lot of these beers is absolutely incredible. They have a smooth, creamy, and soft mouthfeel that sets them apart from other IPAs. The bitterness on these beers is noticeable, but rarely too assertive. These beers tend to load up on late and dry hops to get huge flavor and aroma. The balance of flavors a lot of these breweries pull off is incredible. 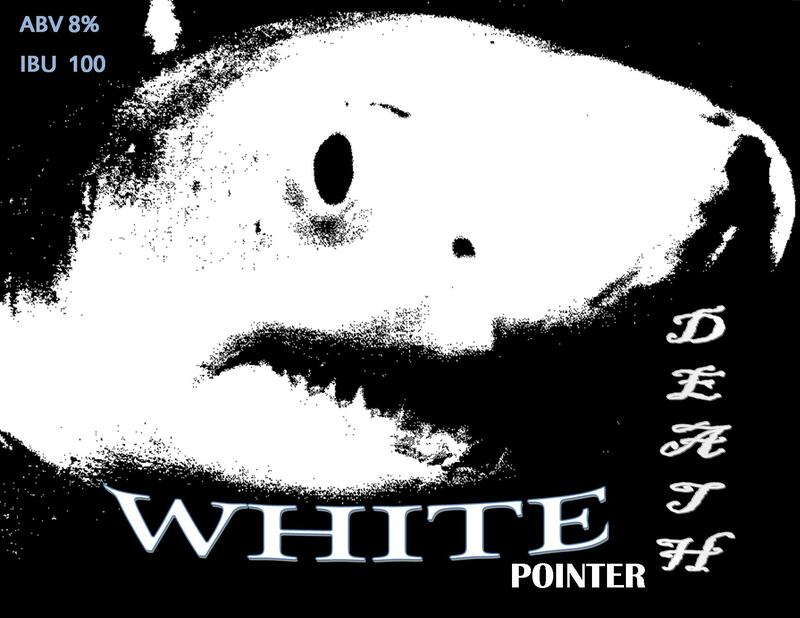 I’m trying to get White Death to encompass all the things I love about the beers from this part of the country. I’m still using the Heady Topper Conan strain on this beer since I love the fruitiness and mouthfeel the yeast leaves. I’m still chasing the incredible body that beers from Hill Farmstead, Trillium, and Tired Hands seem to have so I made a few adjustments with this goal in mind. I added some of the oats back into the recipe from the 1st version as well as adding carapils to keep the beer from drying out too much. I also changed the water profile by upping chloride and dropping the sulfate to smooth things out further. After working with both Golden Promise and Pearl malt a few times each, I’ve found I prefer the Golden Promise. Much like in the 1st version of this beer, I went with a 2 Row and Golden Promise mix. Golden Promise has a sweet bready flavor that I really like, and I was tempted to use a higher portion of it, but in the end I went with a 50/50 split with the 2 row just in case that sweetness would take from the hops. I still like the Pearl malt, but I find it more grainy rather than bready which is what I want in this beer. I kept the pound of White Wheat I’ve been using in this recipe. I simplified the hop bill a bit by cutting out the Apollo hops and upping the Columbus additions as well as using Columbus for bittering. I actually like Apollo hops a lot, but my LHBS doesn’t stock them and I got tired of having to pay for shipping just for hops. I tried to make Simcoe and Columbus the stars of the show more, with Mosaic and Citra supporting. With Conan yeast adding fruity flavors in addition to the Mosaic and Citra, I felt loading more Simcoe and Columbus would bring out more of the pine and dank notes to balance the fruit. This brew day was done on a Friday night, with just me and Kristin. I love my busy brew days with my friends, but this was a nice low key change of pace. This is my favorite beer I make, and I wanted to be focused on my process to get it perfect since this will be its first trip to the keg. The brew night went perfectly, no steps were missed and no mistakes were made. I hit my 152 mash temp on the dot. I boiled for 60 minutes and chilled to 180 to do a 30 minute hopstand. The OG came in at 1.075. The first round of dry hops went into the primary at day 5. They’ll sit there for 4 or 5 days until I rack to the keg for the second round of dry hops. Update 06/24/15: The beer went in the keg last night for a second round of dry hopping. It’ll sit there at room temp for 4 more days and then I’ll remove the hops and get carbonating. The gravity sample came in at 1.014, right where I was hoping. The sample tasted great. One thing I noticed was the bitterness on this version. I don’t think I’d ever bittered with Columbus until now and the bitterness is a bit sharper than Warrior or Apollo. That’s not to say I don’t like it, and it’ll be interesting to see how it is with another week of conditioning and with carbonation. Appearance: The beer pours a beautiful hazy golden/orange color. This version looks just like the previous batches. The beer is hazy, which is fine by me for this type of beer. Kegging helps the head stick around nicely and the beer leaves nice lacing on the glass. Smell: This batch had heavy orange citrus aroma. There are hints of grapefruit, pineapple, and peach as well. There also a heavier pine and earthy element to this batch. The aroma of this one was pretty strong, I like what layering the dry hops does for this one. Taste: The bitterness in this version is sharper than previous ones from the use of Columbus as a bittering hop. Its still a great beer, but the bitterness is a bit sharper than I’d prefer. Some people would like this, but I want the flavors in this beer to be a bit rounder. The bitterness of this beer lingers longer than I’d prefer. This version of the recipe is very resiny. There’s a bit less fruit than previous versions, but its still there. The fruity hop flavors follow the nose with orange, grapefruit, peach, and pineapple. The malt body has a nice bready flavor thanks to the Golden Promise, but I may just go with straight 2 row for simplicity’s sake next time. Mouthfeel: This is an area that improved over the previous versions. I’m really like liking the higher levels of chloride in my hoppy beers. That combined with the oats, wheat, and yeast really do wonders for the body of this one. The beer has medium carbonation. Overall: This beer took a couple steps forward in some areas and a couple steps back in others. Don’t get me wrong, I’m still really happy with this beer, but there are things I’d like to change before I brew it again. Lets start with what works. Kegging helped this beer in a number of areas. Its held up way better than any of the batches of this that I bottled. The aroma has been clearer and more powerful. The flavors seem a bit bolder. The mouthfeel is smooth, almost creamy, but still dry enough to stay very drinkable. As far as improvements go, it’s mostly fine tuning at this point with one or two bigger things. I’m going to bitter with a cleaner hop next time like Warrior, the Columbus was too sharp for my tastes. I went a bit heavy on the Columbus in the flavor and aroma additions as well. I need to bring some of the fruity notes from the Mosaic and Citra back into focus, this batch was a bit more resiny than I wanted. For the malt, I may try going just 2 row as the base. I’ll keep the wheat and oats, and likely add a bit of caramalt in place of the carapils. The last charge is a maybe: yeast. I really like Wyeast London Ale III when I used it in my summer ale. I plan on doing a side by side with London Ale III and Conan in an APA as a test before I decide this for sure. I really like both yeasts, and it will be the only way I can choose between the two. All in all, this was still a great beer and I know what I need to do to perfect this recipe. 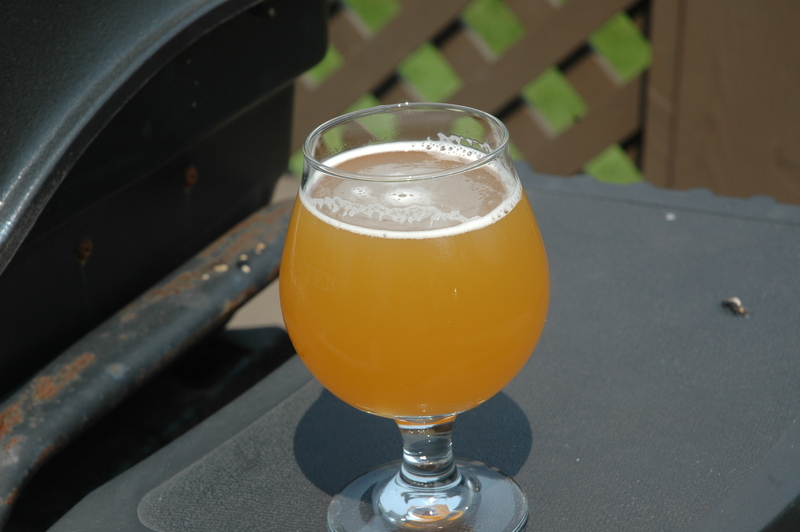 This entry was posted in Recipes and tagged Double IPA, Golden Promise, Hoppy, IPA, Northeast by White Pointer Brewery. Bookmark the permalink.